Will he? Won't he? Roger Federer has cast an element of doubt over whether he will compete in the tennis season's second grand slam -- next month's French Open. (CNN) Will he? Won't he? Roger Federer has cast an element of doubt over whether he will compete in the tennis season's second grand slam -- next month's French Open. The Swiss great told CNN Sport that missing the second major of the year to extend his current break from the Tour was "still an option right now" and he will make a firm decision just before the French Open starts. Federer, who missed six months of last season with a knee injury, surprised the tennis world in March by announcing he would take eight weeks off to recover from a fairytale start to the year. At 35, and having won the three biggest titles of the year to date -- the Australian Open, Indian Wells and the Miami Open -- the 18-time grand slam champion decided he needed to rest and would return to action two weeks before the start of the French Open on May 22. But Federer, who has won the French Open once, in 2009, told CNN Sport: "I don't think I will skip it, but I will have to see in, say, four or five weeks how I feel when I get on the clay, how my mood is. "If I feel like I'm not 100% in it, that I'm (not) really fired up -- and I believe that is something possible -- then it is better to skip it. "But then I think maybe the break is a long one. It will be 10 weeks until the grass -- that could be a bit long, but I will make a definite decision in five weeks. But I think I will play the French." Last month the world No.4 revealed his physiotherapist had advised him not to play too many matches on clay because of the impact the demanding red dirt would have on his knee. He had, after all, taken an enforced six months off after Wimbledon last year because of an injury which had threatened to end his glorious career. After winning the Miami Open in March, his 20th match of the season, Federer said his body and his mind needed time away from the grueling Tour. 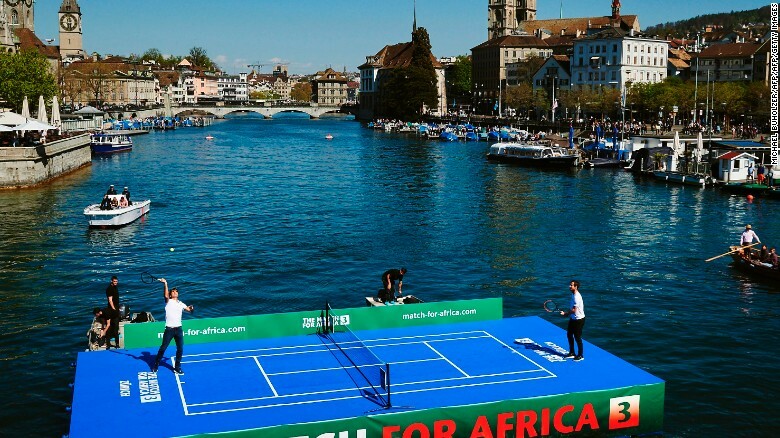 Roger Federer (L) plays world No.1 Andy Murray on a floating tennis court before the pair prepared to play each other in 'Match for Africa 3' to raise money for the Swiss' foundation. 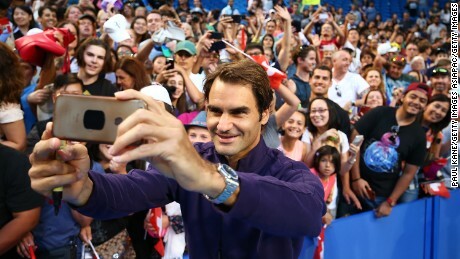 Federer, outside the world's top 10 before his incredible Australian Open triumph in January, has climbed to No.4 in the world rankings, having suffered defeat just once this year. The Swiss will not currently play enough matches to close the big gap between him and world No.1 Andy Murray, who is six years his junior. In fact, these days Federer is less concerned about his ranking and has no intention of changing his schedule in a bid to knock Murray off the top spot. "I just don't think I can," said Federer, speaking before his exhibition match with Murray for the Swiss' foundation earlier this month. "I would like to. At 23 years old, absolutely, you can start saying I'll play the last 20 tournaments of the season if it helps with me getting a better chance with the world No.1. "That's exactly, though, when I get injured. That's exactly when I burn out and that's exactly when it all ends so that's exactly why I did take a break for six to seven weeks and just really relax the body again. "I also said the mind needs a break, the stress and pressure that I have every single day from playing is a lot. "I won't change anything. If it happens great, but I really think it's a long, long shot. But, who knows. I really hope I can do very well at Wimbledon and the US Open this year." It is at Wimbledon, not the French Open, where Federer is more likely to claim his 19th grand slam. Rafael Nadal, Novak Djokovic and Murray will be above him in the pecking order in Paris on a surface he has not always enjoyed playing on. But even if he did win a record eighth Wimbledon title, Federer said he had no plans to retire. Should Federer compete at the French Open? Have your say on CNN Sport's Facebook page. "Honestly, I wish I knew a date, where I said 'okay this is going to be my last tournament,' then I could plan my whole life around it, but I don't," he said. "I want to leave it open. We'll see what happens, see what I feel. I just hope when I leave, I can do it on my terms."